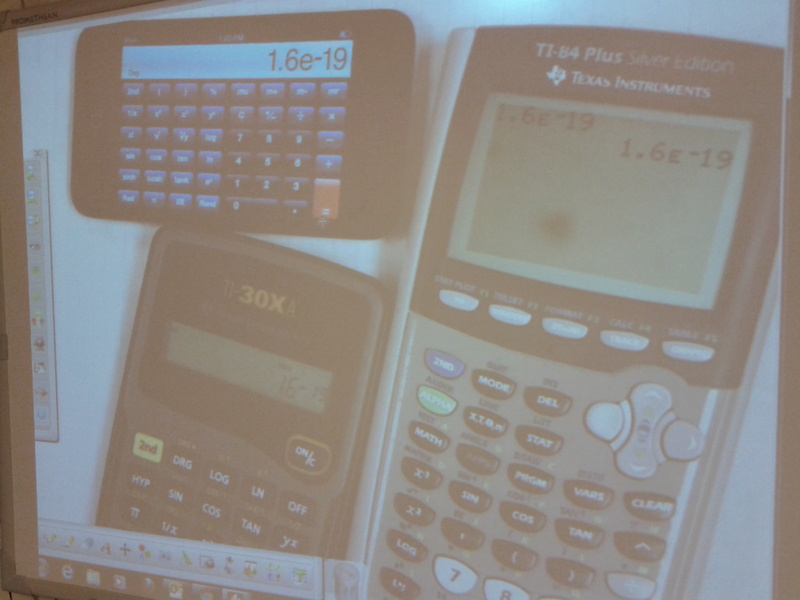 140 On Wednesday 4/17 I tried to forestall difficulties with calculations using scientific notation with the conceptual class by using several different calculator examples. This is one of those times when I am so happy that I have a document camera! Perhaps you recognize the number in the display of each calculator. 126 (Monday, March 25th) This video demonstrates the difficulty some groups had in collecting data from the squishy circuits lab. The conductive dough they made never gave consistent readings. When we got frustrated with trying to measure ΔV and I for their dough, we tried measuring R directly using the digital multimeters. The video shows the readings for a given chunk of dough measured in MΩ, fluctuating between 1.02 MΩ in the first frame and 0.55 MΩ in the last frame. There will be a lot of experimental uncertainty to write about in the lab report! 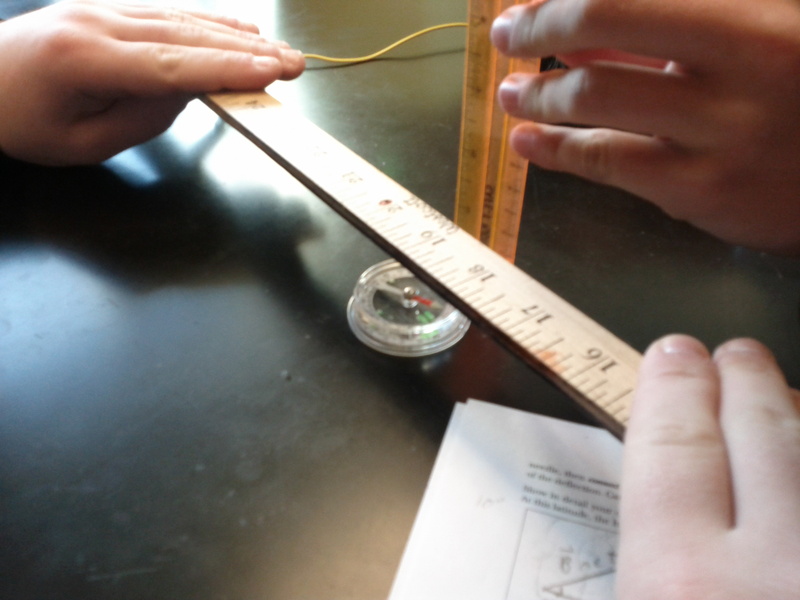 125 The AP class is investigating the resistivity of conductive dough. I was going to make it myself, but then I had jury duty and I had to ask the kids to make it and bring it in. Which they did! It seemed to work pretty well for some groups, but not for others. I will be experimenting on my own at home to troubleshoot some of the issues. Mostly, it had nothing to do with kids using the digital multimeters incorrectly to measure current, though if they did things wrong yesterday they may have blown a fuse and I could not tell. So that is another thing I need to check. 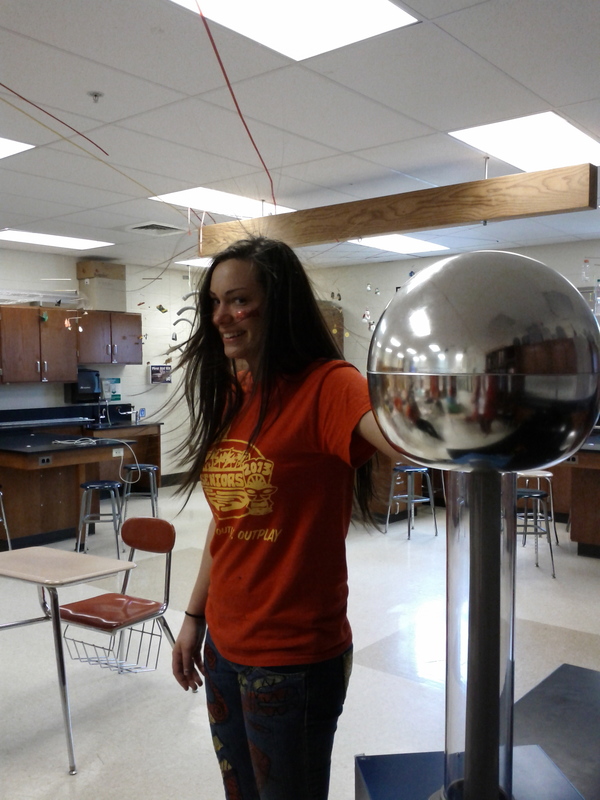 106 Some of my kids are missing today’s (Friday, 2/22) lecture on electric potential. So I had three kids video it, and I am trying to edit it into one video. Tiring! But here is a small clip.